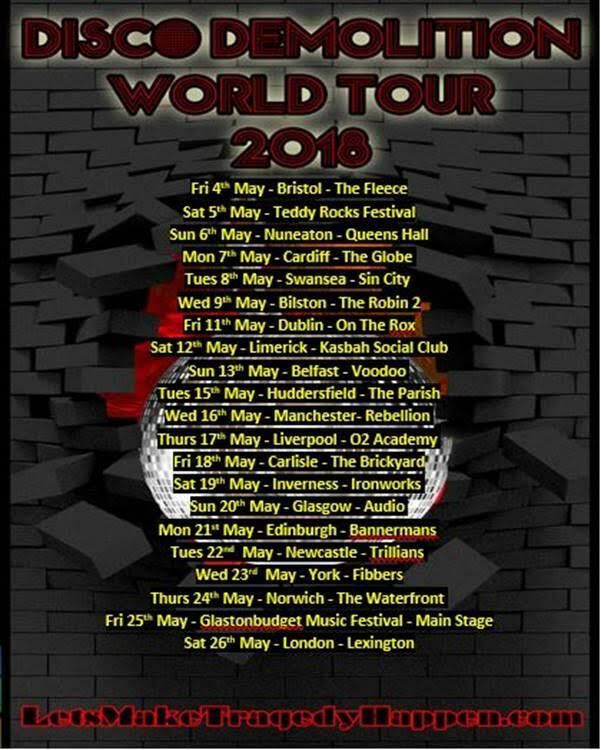 Mosh April 4, 2018 Tours/Live Dates No Comments on Tragedy poised to destroy the UK/IRL once again! 21 shows in 23 days!?! Only New York City’s legendary Tragedy could be so bold! Catch the band on their high-kicking, mascara-smudging, booty-shaking blitz around the UK and Ireland throughout May 2018. From personal experience we can tell you that they put on a brilliant live show! Disco Demolition Night – July 12th, 1979. A baseball game at Comiskey Park in Chicago is interrupted by 70,000 anti-disco fanatics storming the field, setting disco albums ablaze. The Bee Gees blame this event for the death of disco. Decades later, the ghost of disco gets its revenge, in the form of Tragedy: All Metal Tribute to the Bee Gees & Beyond. You might openly love/hate disco or metal. You may secretly love/hate disco or metal. But, you will definitely love Tragedy and their bombastic mix of music, glitter and magic.